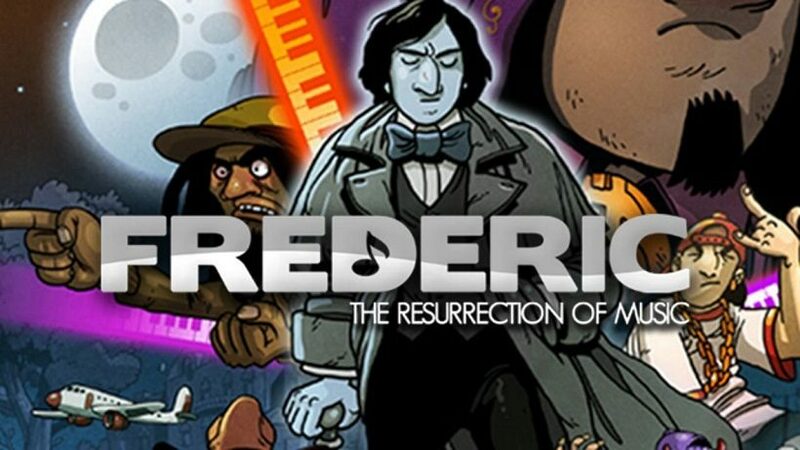 Frederic: The Resurrection of Music has you play as Frederic Chopin – yeah, the actual composer – in a piano-based adventure. Taking inspiration from all your favourite musical games, this is all about playing the right notes at the right time, though experience of playing the piano is not required. Frederic offers an hour or two of musical entertainment. The overall gameplay presentation is reminiscent of the Guitar Hero series – notes approach your instrument from afar, and you’ll need to play each of them in time by hitting the correct buttons, or touching the correct part of the screen. The Switch is best used in handheld mode for this, so you can press the keys on a simplified board (they’re all assigned buttons should you feel compelled to play on the TV). The difficulty level ramps up rather quickly – you’ll find yourself having to play quick blends of notes one after the other at points, and rather than simply playing a regular piano where the notes all sound as you might expect them to, Frederic has you focusing on the notes that you’re currently playing so anticipating those which are coming next on a new song can be tough. Fortunately, each of the songs do repeat sections frequently, offering you a chance to familiarise yourself with the music on the first runthrough before going for a bigger points score the next time around. Nailing it, though, is a really satisfying experience. 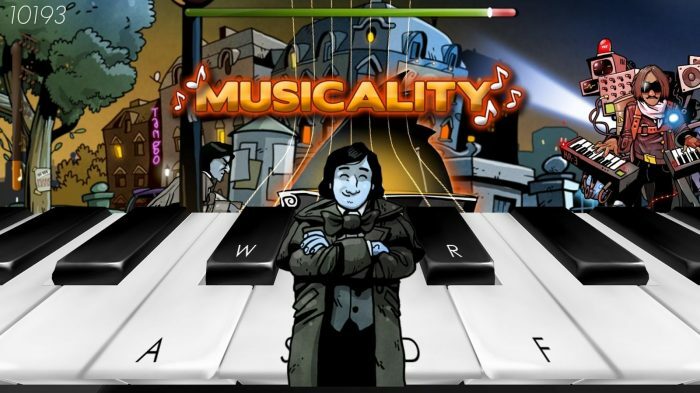 The difficulty level is just about at the right point that you feel as if you really are a piano maestro, even though you’re playing on an instrument which is about an eighth of the size of the real thing. Miss a note and the game feeds back with a very dull and out-of-tune twang, which does have the effect of encouraging you not to mess up again. 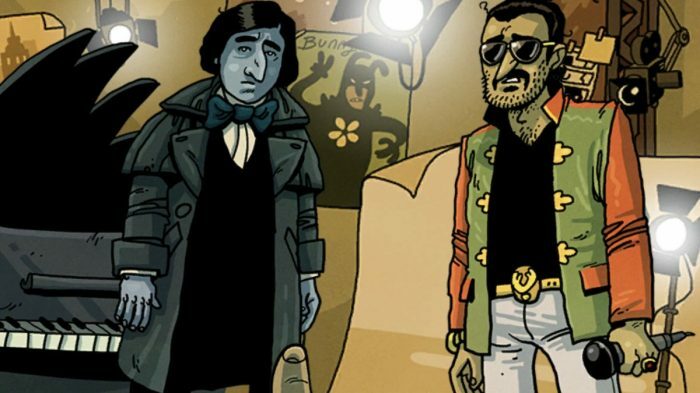 All sorts of wacky characters meet Frederic on his journey. 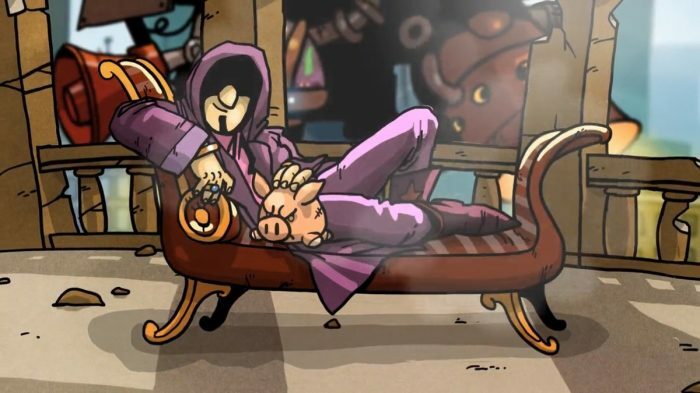 The game offers about an hour of comic-book-style animated story, featuring a bunch of caricatures. It’s all about “beating” an opponent in playing the piano and keeping time – play the notes, and not where you think they’ll be from the music, and you should be alright. You go on a globetrotting mission of facing off in musical battles against stereotypical enemies, with the ultimate aim of tracking down a mysterious hooded man to find out the reason that Frederic has been brought back to life. The illustrations look expensive and are definitely satisfying, though Chopin himself has a deadman-like dark hue to him which makes him stick out like a sore thumb. The mysterious hooded figure behind all the wrongdoing. Frederic: The Resurrection of Music is an enjoyable, if short, piano adventure, though it’s not quite without its drawbacks. While the controls are on the whole self-explanatory, for the maximum points scores you’re offered opportunities to use a special boost by hitting the L and R buttons at the same time. When in touchscreen mode, this is really tough to do due to where your hands are. On the other hand, on TV mode, the overall controls are less intuitive as to where the notes are button-mapped, so there is no all-conquering superior method. You can’t even advocate using the Switch stand in handheld mode, because you really want the Switch to be placed on a flat surface to simulate piano playing most effectively. Bear with it, though, and there’s a bit of fun to be had. One of the craziest ideas for a plotline ever is matched by a pretty enjoyable game. And it’s really cheap on the eShop, which can only be a bonus.